Voluntary forever? Forever ever? Without any sort of sneaky upgrades? Windows Phone users who might have been nervously awaiting Windows 10 Mobile have been told they can relax. Unlike Microsoft’s aggressive tactics to migrate users from Windows 7 and Windows 8.1 (which have ticked off customers), Windows Phone users won’t have to accept Windows 10 Mobile upgrades if they don’t want to. Microsoft began rolling out upgrades from older Windows Phone 8.1 phones to Windows 10 Mobile on Thursday, with a list of about a dozen eligible phones. 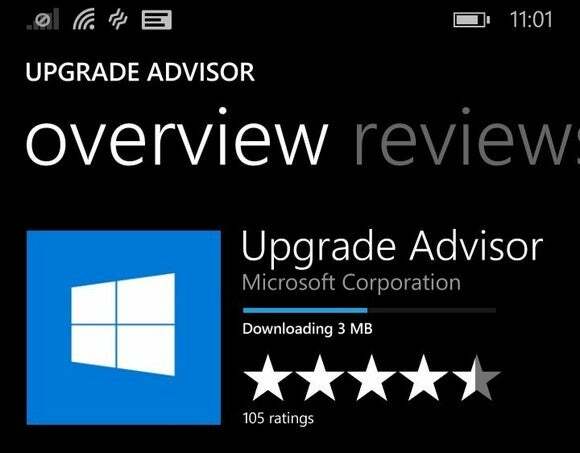 So far, Microsoft has asked users to download and launch an “Upgrade Advisor” app to trigger the download. It hasn’t always worked, however, as Microsoft said availability will vary by device manufacturer, model, country, and other factors. The big difference between this rollout and that of its Windows 10 desktop cousin is that customers will have the option to decline it, a Microsoft spokeswoman said. “We are going to start the roll-out via the Windows 10 Upgrade Advisor app to help ensure we deliver a high quality experience,” she said. Why this matters: Users have been outraged with the sneaky tactics that Microsoft has used to lure users onto Windows 10. The most recent tactic reclassifies Windows 10 as a “Recommended” update that most users would automatically accept. It’s certainly possible that Microsoft also plans to repeat these practices in the mobile space with behind-the-scenes downloads. But that's easier to do with PCs, where Microsoft maintains a dominant market share. In the mobile space, it’s on life support. Ticking off customers could literally be the straw that breaks Windows 10’s back.